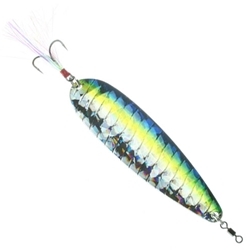 The Nichols Lake Fork Flutter Spoon is the hottest bait on the ledges today. The Spooning technique has caught fire, the 4" and 5" flutter spoons meet every need. Available in multiple finishes, the baits flutter perfectly, featureing qualtiy Trokar trebles with hand-tied mylar strands.